Diluted chemo drug scandal — why was this ever contracted out? It looked for a while that Marchese Hospital Solutions’ explanation for the diluted chemotherapy drug bags may have had legs, suggesting there was miscommunication between hospital purchasing agent Medbuy and Marchese over the use of the product. Marchese claimed it was their understanding that the bags of chemotherapy drugs they were preparing were to be administered as a single dose entirely to one patient, when in fact the contents of the bags were being used for multiple doses. Appearing before a Ontario legislature committee probing how 1200 cancer patients received diluted doses of chemotherapy, Anne Miao, director of pharmacy for rival corporation Baxter, told the committee that Marchese’s explanation was far-fetched. 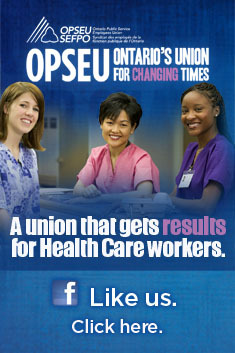 Peterborough’s regional hospital is losing more staff positions. The good news is the hospital administration isn’t at least pretending these new cuts are about “transformation” of the health system as the Health Minister and Premier have repeatedly claimed elsewhere. The government’s ongoing funding freeze to base hospital budgets means 53 more positions are being eliminated in Peterborough, many of these already vacant positions. In 2010 Peterborough eliminated close to 300 full-time equivalent positions to deal with a mounting deficit and meet its accountability obligations to the Local Health Integration Network. Chemo drug scandal: Why would Peterborough contract out in the first place? Craig Woudsma is the reluctant hero of the so-called “chemo drug scandal.” He is the OPSEU pharmacy assistant at the Peterborough Regional Health Centre who stopped to question the differences between oncology medication prepared by the hospital’s old contract supplier and the new – Marchese Hospital Solutions. He was the first to do so. 1200 cancer patients received less than their prescribed dose due to an error that has four Ontario hospitals, their purchasing agent, and Marchese all pointing fingers at each other. Yesterday Woudsma may have not felt the hero, appearing before the Ontario’s legislature’s social policy committee heavily coached by senior hospital officials and their contract lawyer, who sat directly behind him and his senior colleague Judy Turner. As it turns out, maybe it was the hospital officials themselves who should have been back on the hot seat. Why would Peterborough Regional Health Centre want to contract out the preparation of oncology drugs 200 kilometers away in Hamilton when it had the resources to do so on site? Who is responsible for the unexpectedly diluted chemotherapy cocktail that more than a 1,000 cancer patients received since February 2012? And will we ever know when aspects of the story are being treated as safely guarded secrets? The issue has been making headlines this week with fingers pointing in all directions. At least two of the hospitals involved have now taken back the preparation of the drug cocktail – both Durham Region’s Lakeridge Health and the Windsor Regional Hospital have said they are able to prepare it themselves. Did he really say that with a straight face, especially after knowing the questions London patients and their families must now have? When the province introduced its new hospital funding formula, it specifically highlighted its intention not to subject small rural hospitals to it. Evidently when the Minister meant small, she meant very small. South Bruce Grey Health Centre is reporting that the new hospital funding formula means they will be facing a $622,000 shortfall next year. SBGHC is made up of four very small hospital sites in Walkerton, Durham, Kincardine and Chesley. With four hospitals, it’s total budget is about $41.7 million, of which $29.5 million comes directly from the Ministry of Health (another $6.3 million comes in MOH physician funding). The community makes the argument that had these four hospitals not been amalgamated, they would not be subject to this punitive funding formula. When faced with underfunding, should hospital CEOs make clear the consequences, or should they quietly find ways to cut services that may be less noticeable to the public? For the first time since the Harris government, the McGuinty government has frozen base funding for hospitals. In addition it has introduced a new funding formula that is having negative repercussions for some. We have always argued that having a funding formula makes sense, but such a formula should be grandfathered in so that hospitals on the losing end of the equation are not adversely affected. There are also questions about whether the formula itself is fair, some arguing that existing patterns of use are partly determined by where existing services are, as opposed to where services should be. The net result of these changes in funding is hospitals are faced with particularly difficult choices this year. Many choose to quietly go about their chopping, limiting input to board and management. Others talk publicly about consequences leaving the broader community an opening to debate what should take place. The latest to talk about consequences is David Musyj, CEO of the Windsor Regional Hospital. Last week Musyj warned of possible layoffs and cuts to services, such as endoscopy and ultrasound – both he says are offered at private clinics in his community. Earlier this year we issued a freedom of information request to 20 sample hospitals where OPSEU represents health care workers to understand whether managers are in fact replacing front line health care workers. Nine of 20 hospitals reported an increase in managers proportionate to front line staff over the past five years. It’s a frequent complaint we hear. While the requests were sent out in February, the information took much of the year to trickle in. Resources are getting ever tighter in the hospital world – Ontario hospitals are experiencing no increase in their base budgets this year. How hospitals allocate their funding does matter. Some hospitals actually reduced managers – at Kingston General Hospital, for example, managers dropped from 146 in 2008 to 125 in 2012. Staff has remained almost exactly the same over the past five years at 2,453. Other hospitals that dropped managers include the Chatham Kent Health Alliance, South Grey Bruce Health Care and the Windsor Regional Hospital. Others show that our members were right.